It’s a long way from Elmhurst to Lusaka, the capital city of Zambia in south-central Africa. But last year, the love of soccer and connections through Facebook made the distance a lot shorter. Last spring, the Stukel family of Elmhurst was hosting a visiting coach for their son’s soccer team, Elmhurst Football Club (EFC). Coach Erik Lek of Sweden had been in Elmhurst about four weeks when a co-coach at his former team tagged him in a Facebook post seeking used soccer gear. ‘Host Mom’ Laura Stukel saw the exchange between Lek and Coach Patrick Luwephiri and within days the Soccer Gear for Zambia project was off and running. “When Erik got home from coaching, I asked him how much gear Coach Patrick might need,” said Stukel. Lek had explained that athletes compete on dirt fields, often without shoes. The pitch gets knotted with roots in the dry season making it even harder to play. He added that players often craft their own balls out of spare bags and plastic. As a six-year soccer mom, Stukel knew how fast unneeded soccer gear can accumulate and, as a lifelong resident of Elmhurst, she knew the generosity of her community. She quickly envisioned a garage full of gear for Coach Patrick’s team. Later, Lek admitted he expected one box. Turns out Stukel exactly predicted the generosity of Elmhurst’s soccer community. Fueled by a gear drop hosted by the local American Youth Soccer Organization (AYSO Region 399) which turns over gear every year, a bi-annual uniform swap was coordinated by EFC and the 2017 collection drive for Soccer Gear for Zambia resulted in more than 1000 items in 13 boxes. The gear included badly-needed soccer cleats, balls and uniforms. There was so much gear in fact that Coach Luwephiri shared some of it with another one of Lek’s former co-coaches, Coach Job Mwanza in a rural area of Zambia called Petauke. 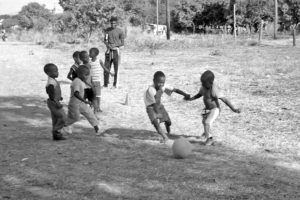 Luwephiri and Mwanza are both lifelong soccer players as well as community activists and philanthropists. Since Lek left Lusaka, both coaches have gone on to found their own soccer programs. Luwephiri now runs CHILD LIFE Soccer Academy and Mwanza runs Rural Sports Foundation Zambia. Both programs use soccer training or tournaments as incentives to keep athletes in school, to partake in community clean up days and to attend education on topics that promote clean water, HIV prevention and mitigation of child marriages. CHILD LIFE uses the larger inventory of EFC uniforms for their ongoing team program, while the smaller sets of AYSO uniforms are used for community tournaments. Stukel is now working on a 2018 collection drive. The gear will be sent primarily to Rural Sports Foundation Zambia. Soccer season has just ended in Elmhurst, so she is collecting any balls, uniforms and cleats that are not needed here for next season in a brown collection bin outside her home at 417 S. Washington. Team Elmhurst Soccer Club (TESC) is doing its bi-annual uniform swap this year. The collection closes July 10 so items can be packed as ocean freight for the July cargo shipment by AmeZam shipping. AmeZam specializes in shipments between the U.S. and Zambia and minimizes costs and tax implications for donations and humanitarian shipments such as the Soccer Gear for Zambia items. In addition to balls, cleats and uniforms, Stukel is recruiting “Box Angels” for $100 to cover shipping for one container or $50 to share a box with another “Angel.” She has received inquiries from two similar soccer programs in Zambia. She’s also seeking “Club Angels” who would be willing to adopt one of these clubs, organize their own collection drive and ship to the lead coaches, using Stukel’s experience to make the process as easy as possible. For more information or to become an “Angel,” Stukel can be reached via the Soccer Gear for Zambia page on Facebook or at laurars@usa.com. 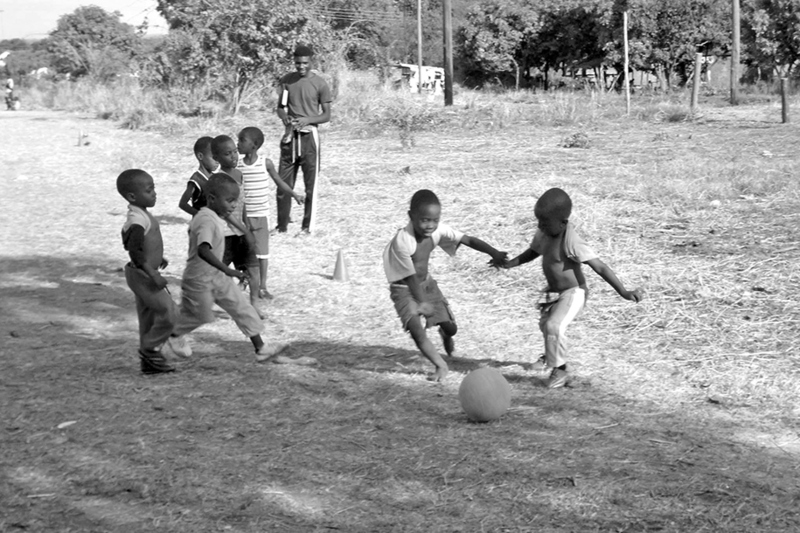 Club angels are critical to grow the program and serve more players in Zambia. Stukel is hoping to recruit at least three clubs in DuPage County as well as at least three more in AmeZam cities including Kansas City, St. Louis, Minneapolis, South Bend and Cleveland.